Viber is a mobile messaging service that enables users to place phone calls and send text messages to all other Viber users without any cost. This free instant messaging and VoIP app is built to be compatible and run on various mobile operating systems. With Viber, users are not only limited to voice calls and chat; they can also exchange images, video and audio media using the platform. Viber is a a very useful app especially for businesses and individuals who require a functional messaging system without the burdening cost. Viber lets members call and message each other for free via Wi-Fi or 3G connectivity. The app also offers charged international calls to unregistered landline and mobile numbers for insanely low rates. The messaging app is also an inexpensive way to share images, files, and audio. 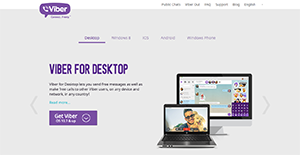 On top of all that, Viber runs on virtually every known messaging device – desktop, laptops and smartphones, giving users flexibility as well as functionality to take their business to the next level. Every enterprise has different wants and requires a software that can be personalized for their size, kind of workers and buyers, and the particular industry they are in. For these reasons, no platform can offer perfect functionality off-the-shelf. When you try to find a software app, first be sure what you require it for. Read some Viber reviews and ask yourself do you need basic tools or do you want sophisticated features? Are there any industry-specific functionalities that you are seeking? Find the answers to these questions to assist your search. There are multiple factors that you need to reflect on and these include your budget, particular business wants, your organization size, integration requirements etc. Take your time, use a few free trials, and finally select the platform that presents all that you need to improve your organization competence and productivity. How Much Does Viber Cost? We realize that when you make a decision to buy Communications Software it’s important not only to see how experts evaluate it in their reviews, but also to find out if the real people and companies that buy it are actually satisfied with the product. That’s why we’ve created our behavior-based Customer Satisfaction Algorithm™ that gathers customer reviews, comments and Viber reviews across a wide range of social media sites. The data is then presented in an easy to digest form showing how many people had positive and negative experience with Viber. With that information at hand you should be equipped to make an informed buying decision that you won’t regret. A communication app that everyone should have. Making high quality calls on a bad broadband is cool, but dealing with spam is disappointing! It functions similar to Skype. But a lot better in a number of ways. It's a great app that caters to my communication needs. What are Viber pricing details? What integrations are available for Viber? Pros: Ever since I got myself a smartphone, Viber allowed me to connect with friends and family. It's been my most used app out of all mobile communication platforms. Compared to other VOIP apps, Viber offers crystal clear video and audio calls. They can be used in all devices so there's no need for you to check your Windows PC or MacBook. Cons: It's hard to hate anything that this app is offering. It's nifty software that bombards you with zero ads. Pros: Voice messsaging is awesome. Even if you internet connectivity is terrible, you can clearly hear the person on the other end of the line. A desktop app is ability with some functionality. Both mobile and desktop apps are stable and free from most bugs. Cons: Some users are difficult to block. It's really hard to remove yourself from subscription offers from third party companies. I can't even copy mobile numbers from a specific profile. The issue happens to both the mobile and desktop version. An excellent Skype alternative with less usage in resources. Android and iOS compatibility makes this a personal favorite. A great mobile option to Skype. If you need more information about Viber or you simply have a question let us know what you need and we’ll forward your request directly to the vendor.